Ah, it was a nice relaxed day of getting chores done in town. Why Not and I stayed in Bishop while Rockin’ rented a car and drove home to Tehachapi to get treatment for some pre-hike allergies and a sinus and chest infection. We all had blogs to update, resupplies to do, families to call, and gear that needed to be purchased, fixed, or swapped out. Basic town stuff. I caught up on some emails, got to talk to friends, and Skyped with my nephews. Still didn’t get enough done to watch the last few episodes of VEEP, but I still have time to hopefully do that tomorrow before we set off in the afternoon. Let’s see, what else…I replaced a pole tip that broke, and we all got chapstick with Zinc in it, and some cheap grippy gardening gloves to save our hands from all that granite when we are in the boulders. We are all frying with the sun reflecting from all directions, so I’m caving an getting one of those safari hats. Fortunately, I found a blue one at least! I want to give a big shout out to Bishop’s Sage To Summit for being awesome and recommend dropping in there if you’re in Bishop! Bring it on relentless sun! We added a day to this next resupply for extra padding. None of us are looking forward to the long haul back over Bishop Pass at 11,972ft, but it’s nice to give ourselves more time and know we don’t have to push overly hard. We’ll be pushing, that’s for sure, but no need for making it more stressful than it already is. Here’s a shot of the next week worth of food for myself and Why Not. We should be in Mammoth around July 5th. Mine is pretty obvious with labels. 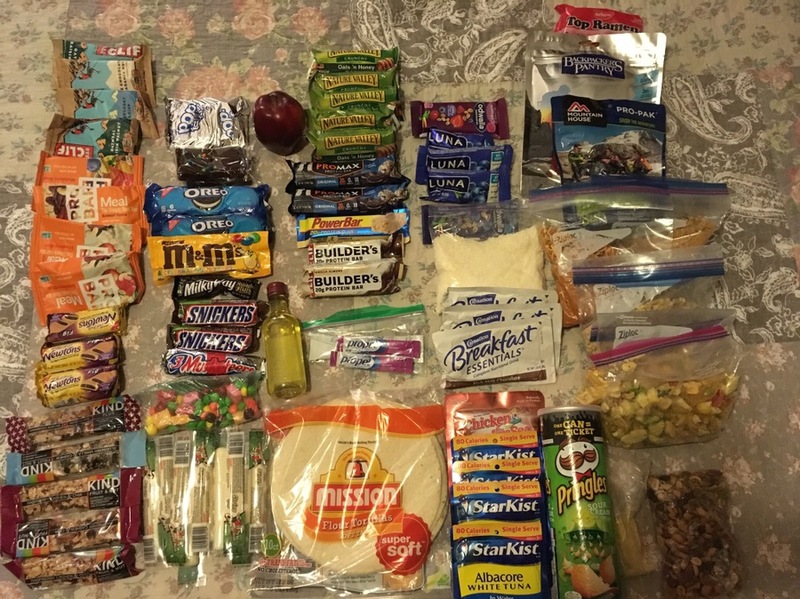 What isn’t labeled are repackaged Mountain House dinners, some dehydrated milk, Skittles & Starbursts, and a bag of various nuts and dried fruit that Why Not has convinced me to try out. My resupply for a week in the high Sierra. Why Not has a lot of her own homemade concoctions. She is no cook (doesn’t carry a stove) and soaks various things for lunch and dinner including dehydrated rice, curry, seasonings, chicken, veggies, chicken sausage, etc. there is also ProBars, Mojo Bars, Trader Joes Organic Corn Chips, Coffee, Nuts, and dried fruit. 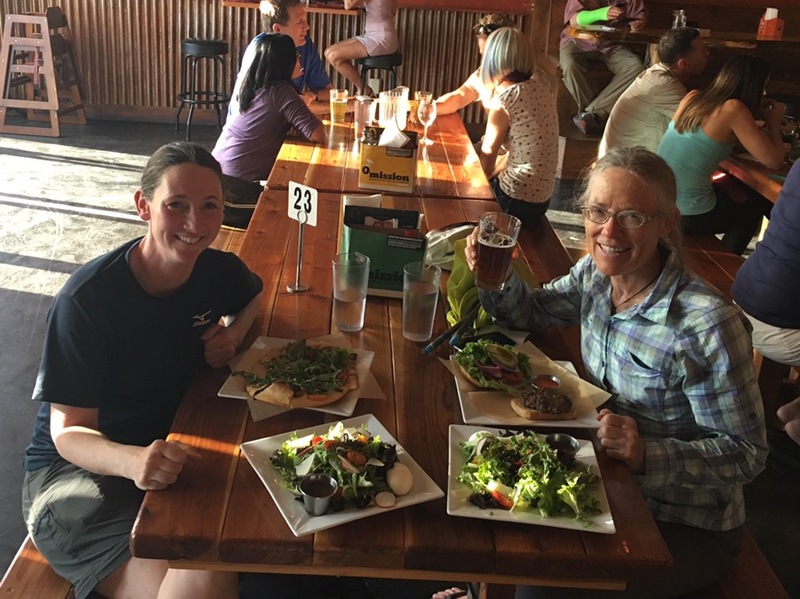 Finally, we ate dinner at the Mountain Rambler Brewery for the second night in a row. We all love their Rustic Salad! Thanks so much to Curt who reached out and treated myself and Why Not to a meal there last night! Dinner at Mountain Rambler Brewery. So as for this next section. Weather is interesting this week with higher chances of rain or brief afternoon t-storms. We are welcoming maybe some clouds! Sadly, as most of you know California wildfires are the earliest they’ve ever been and there are still some going to give some haze. Hopefully nothing more will develop to bring us down. That snow will still be there, but is melting fast. Both good and bad as there is the danger of postholing into something bad. I’m feeling good about moving forward and giving it a go within my comfort zone. There are many options this leg to hike out a side trail if we get to anything I’m not fully comfortable with or if myself or Rockin’ aren’t feeling good since our bodies seem to be not 100%. The hope is that none of that will be necessary, but it’s good to know the option is there if needed. Why Not and Rockin have decided to send home the ice axes and keep their microspikes. I just feel more secure with the ice axe, so I’ll be lugging it at least one more leg along with the micros, which we all may just keep the whole route. I do want to say thanks to everyone! The new blog platform seems to be working out great and although I may not respond to every comment or email, know that they have been read and they are quite encouraging and motivating. Ok, here we go! New posts may not be up for a week…until then you can still check in on the interactive map on my “Where’s Wired” tab to see our progress each day. Remember, this is a route where 10mi in a day is a huge day, so many days will seem like we’ve hardly moved. No worries, we are right on schedule. Slowly inching up there! Happy trails and enjoy the 4th everyone. If timing is right, we may get a good show of some fireworks from the mountains that night. On the highway heading north out of Bishop is Mahogany Smoked Meats, who make some excellent jerky. I always put some in my resupply boxes. I like the elk, but some others like the Habanero Beef are very hot, and I add some to soaking grains to help spice them up. You may be extremely happy to have your ice axe on Snow Tongue Pass ! I put it to use there! Good luck, all three of you. Sending positive thoughts and looking forward to reading your blogs. Does Why Not do a blog? They all 3 do! nancyhikes.com is Why Not’s blog. On the trail again!! Sounds like a massive itinerary this year. Looking forward to following your progress/adventures! Fantastic sandwiches and baked goods in Bishop. Brad, give the Great Basin Bakery a shot next time you’re in Bishop — excellent cinnamon rolls without the tourist vibe/line! I am glad I took it and am finally ditching it for the last week…but it may be back for the Wind River High Route. love following you ladies on this adventure!! wild!!! what blog site are u using? I like your format!! Have fun out there ! Thanks! We all are using WordPress and using their very time consuming app. My blog was just redesigned by Carrie Carter who is linked at the bottom of my blog. 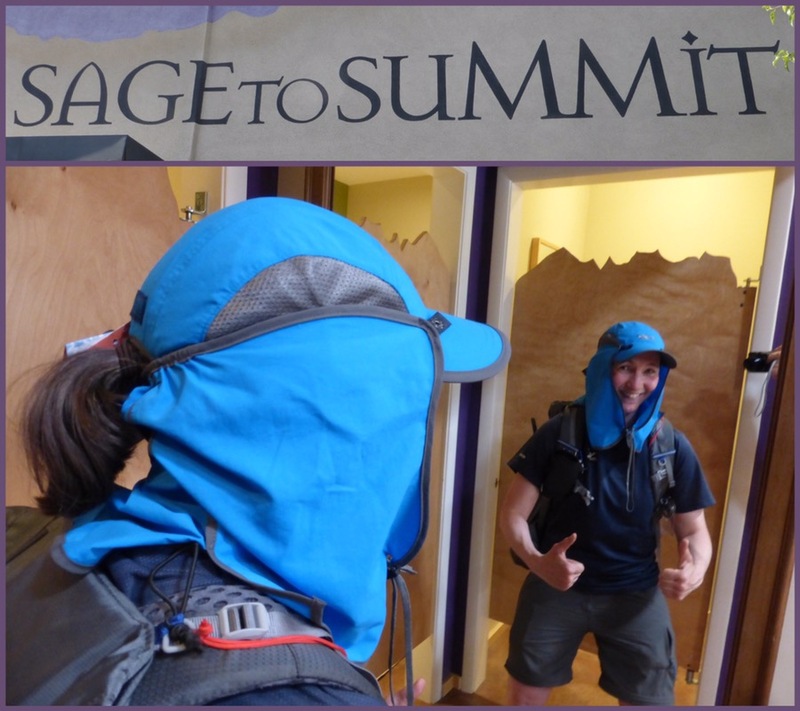 Thanks for the shout-out about Sage to Summit! It is so fun to catch a glimpse into the lives of all the PCT hikers. You guys are kindred spirits. Enjoy your next section. Phew! I find myself taking a deep breath for you on your zero day. Good for you for deciding to continue on AND for giving your self permission to consider not continuing on! While I am very inspired by you, these women at 58, 63 and 72 are the ultimate!!! I am 62 and, well, frankly, won’t be joining you this year!! But I DO keep hiking! Stay safe; take care of yourself; and keep sending outstanding photos and engaging posts. I guess Erin will have to reveal her true age! Erin, I went to the “dorky” hat a few years ago and have benefited from it much. Also going to try a long sleeve t-shirt this year. It is ORs lightest shirt and weighs just over 3 oz. Been using it on many dayhikes and it is OK. Hopefully it’ll be good in the Sierra next month when I’m there. Glad to see you made it safely (although at times it didn’t seem that way) through the first leg and have a chance to get refreshed and rested. I hate heights too, so even your pictures tend to do me in. Please continue to take your time when needed and be safer. Great views and so much beauty to see. What a way to start the summer and a year of great hiking!!! Good luck Wired, have a great time out there! Wired: I’m one of Rockin’s followers and just started following you on this latest adventure. Please let Rockin’ know that I’ll be in Mammoth until July 6 or 7 and I’ll be happy to help with resupply, rides or a round at Mammoth Brewing. I want to eat both your and Why Not’s resupplies! 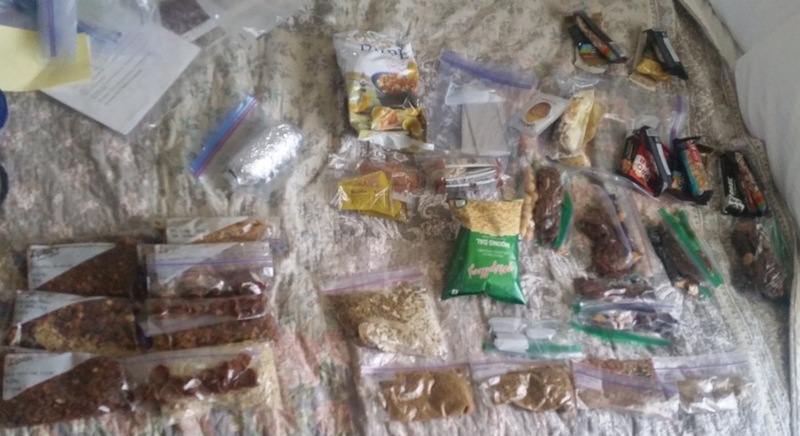 I’m packing for the Canadian Rockies right now and am about to make my own pile of food for 8 days. Hope you are feeling more acclimated on this leg of the route. And a gentle Marmot reminder: the High Sierra Route ain’t now hike! It’s a semi-technical cross country traverse with a few stretches of critter and human-worn path mixed in. It looks like you have pretty ideal conditions (more snow could make it easier to minimize the boulder hopping). Personally, as soon as I step off a trail to go up a mountain or wherever I’m wandering, I consciously shift from my thru-hiker mind-set to that of a scrambler/climber/peakbagger and that means increased focus on the puzzle of the route, carefully considering every step, being gentle with handholds (keep the mountain together, no pulling on the rock), and appreciating that it can take 2 hours to go a mile (and sometimes take longer). Hang in there and if you come away from this trip not in love with the boulder hopping and scrambling – well know that you learned more about what you like and that you gave it a solid go on one the finest traverses you could have for such travel. Careful scrambling and happy hiking! You and Gabriel would be right at home out here on the SHR! We say everyday multiple times how cool and surreal it all is for sure.